I love rain. It is an amazing reality of living in Oregon. Love it or leave it, I say. However, this weekend was a bad one for our area, with many rivers breaching their banks and landslides creating problems throughout the state. 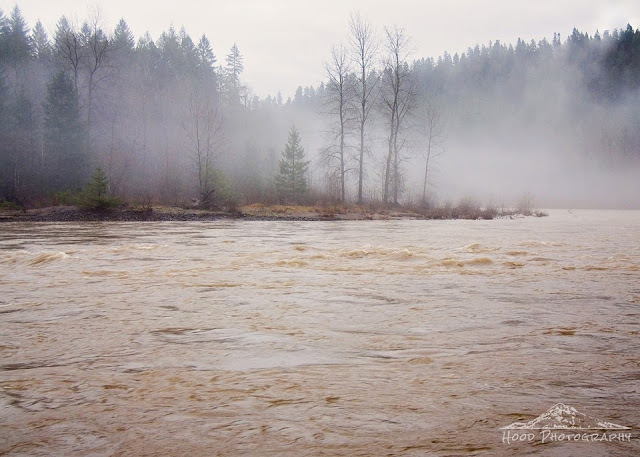 I visited nearby Sandy River and witnessed the excess of water first hand. While I stood on the bank taking this shot, the water came up at least a foot or two in the short time it took me to position, focus and snap a few shots. I was standing at least 2 ft from the edge of the river and within the short minute of shooting my feet were in the river from the expanding swell. Scary, but pretty just the same. WOW .. dramatic shot. Rather scary how fast that water came up. We've had rain up here in WA, but I don't think it's as much as you guys have had. What a frightening moment. But the photo with the misty background over the volume of water is quite stunning. Very neat shot of the river! This winter has been so mild, rainy and dark here in Sweden. Now, atlast, we get some cold. Still no snow. :-( The weather is a bit upsida down. I hope you get a really nice Christmas together with family and friends. ♥ Don't stress to much!